Rare genetic mutation increases muscles, weight of sleek breed. Wendy the Whippet has a genetic disorder that has resulted in an exceptionally muscular appearance. People mistake her for a pitbull with a pinhead, but Wendy the whippet is one rare breed. So rare that the Central Saanich dog recently graced the New York Times. She also had several of her photos shown on The Today Show, all because of a rare genetic mutation that has led to her being the Incredible Hulk of dogs. Wendy is a 27-kilogram rippling mass of muscle. Forget the so-called six-pack stomach: Wendy has a 24-pack. And the muscles around her neck are so thick, they look like a lion's ruff. "People have referred to her as Arnold Schwarzenegger," says doting owner Ingrid Hansen, stroking Wendy's sleek black coat and white chest. Wendy was recently part of a genetics study done in the U.S. on mutation in the myostatin gene in whippets, which resemble greyhounds in appearance. The National Institute of Health study reported that whippets with one single defective copy of the gene have increased muscle mass that can enhance racing performance in the breed, known for speeds up to 60 kilometres an hour. 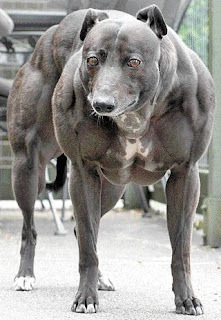 But whippets with two mutated copies of the gene become "double-muscled," like Wendy. It has been seen before in one human, and also in mice, cattle and sheep, says the study. The uber-muscled whippets are called "bullies," not because of their nature -- Wendy likes nothing better than a good back scratch and isn't shy about sitting in your lap to ask for one -- but because of their size. She's about twice the weight of an average whippet, but with the same height and small narrow head -- and the same size heart and lungs, which means she probably won't live as long as normal whippets. Hansen has had Wendy, now four, since she bought the dog from a Shawnigan Lake breeder when she was eight months old. Wendy landed in clover. She lives on an acreage, runs around with other dogs and horses, sleeps on Hansen's bed and pretty much anywhere else she wants to. People are often afraid when the muscle-bound dog runs up to them on her dainty whippet-thin legs, but they soon realize she's friendly, Hansen said.